Scenic vistas of the BC Coast mountains and waters of the Inside Passage make for a unique destination for business or pleasure in Port McNeill on Northern Vancouver Island. For corporate retreats, Port McNeill offers a range of meeting rooms to enable business meetings, plus ample options for outdoor team building exercises. The quiet beach not only offers views of nearby Islands but also a place to sit and clear the head. Rocky beach along the waterfront of Port McNeill, Northern Vancouver Island, British Columbia, Canada. 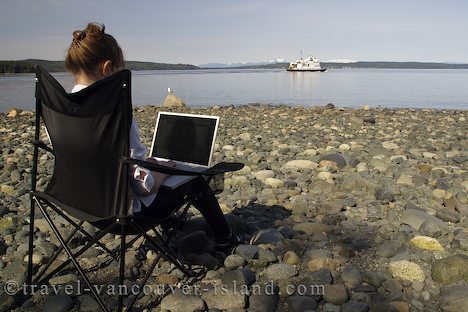 Picture of a woman working with a laptop on the beach in Port McNeill, British Columbia, Canada.